One of the ways in which people like to add a bit of festive cheer to their Champagne (or nearest sparkling wine equivalent) is to drop into the glass a hibiscus flower that’s been soaked in syrup. The effect that has is to add some extra sweetness and a decidedly pink-red tinge. 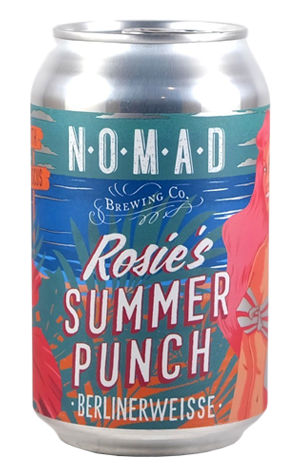 What Nomad did in time for its Christmas 2016 release was to have a go at replicating the Champagne and hibiscus serve, but in beer form. The way in which they went about it was to brew a Berliner Weisse and add hibiscus (also called Rosella, hence her summer punch) to it. With a cloudy pink appearance, the colour deceives you into thinking it’s going to be overtly sweet, but it’s not. The defining character is of sourness while any sweetness and fruity characters brought about by the yeast just hang about on the sides. While sourness does feature it's not to any exceptional degree and you can expect no more acidity in here than your average glass of bubbles. In that regard, if you served this in a flute to an unwitting participant and told them it was Champagne and hibiscus, you'd likely make fools out of more than a few.